Before premiering at the cinemas the film PLAY was shown to two thousand secondary- and high school teenagers in the Västra Götaland region. 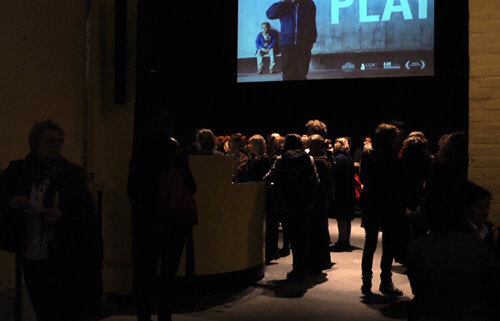 The showings where a collaboration between The Backa Theatre and Plattform Produktion and took place at the Backa Theaters premises at Norra Älvstranden in Gothenburg. In on of the rooms a stand was built and a cinema screen especially adapted for the esthetics of the film. Backa's lobby was used for a sound installation, a large banner and a slideshow that was part of the show. After the showing a behind-the-scenes film could be seen in three video boxes placed in the lobby. Mattias Anderson the artistic director of Backa expressed himself like this in the leaflet " The project is an continuation in reviewing what our house can be used for and furthermore a study in what a scenic event actually is." The interesting thing for me and for Plattform was, among other things, using the expectations and attitudes the audience had towards the theatre compared to the cinema. The difference when comparing the culture at the cinema, with that of the theatre, is obvious at Backa. Here there is a clearly expressed desire to challenge the audience and for the repertoire to take part in the public debate. Through Backa we where also able to reach a young audience who by themselves may never have found the film. An audience who'd had the events that inspired PALY as a part of their everyday life. PLAY at Backa became a way for Plattforms activities to have greater significance in the city where we ourselves live and work. Debate about Play on Backa Teater, 11-10-10. Participants: Lena Andersson – writer, Hynek Pallas – film critic, Shang Imam – radio show host, Lamine Dieng – actor, Ruben Östlund, director. Moderator: Alexandra Pascalidou – journalist.